...... Since it was intended to recruit as many women as possible, the requirements for joining the Corps were not set high. Every woman between 17 and 35 years of age with high school education (having good scholastic records) and in good health could apply. Application for marriage and marriage as a student was permitted, provided that the guidelines of the attended school were followed. This was an important concession. Many young women wanted to get married before their boyfriends had to leave for service duty away from home. 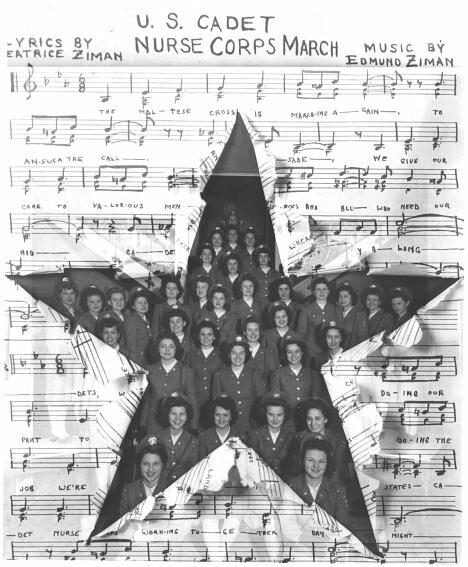 Upon joining the Corps, every woman had to give an induction pledge. The pledge was rather a statement of good intentions than a legal contract. 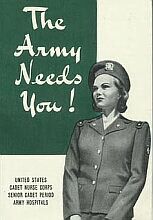 As a Cadet nurse, I pledge to my county my service in essential nursing for the duration of the war. The course of nurse practice and study required for graduation was reduced to 24 to 30 months (instead of the traditional thirty-six months). Despite the expedited training, it was pronounced that Cadet Nurses would received the same complete education as other nurse students and would be eligible as registered nurses after graduation. 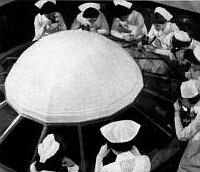 However, in reality, it was impossible to keep the same high standard usually necessary for prewar graduation because these nurse candidates underwent shortened emergency wartime training that sometimes was several months less than the officially announced 24-30 months period. Practice in pediatrics ... For the next 15 to 24 months, the students became Junior Cadets. They spent less time in the classroom and more time in clinical practice, especially in medical and surgical nurse duties, in operating rooms and outpatient departments. In this way, they learned on the job. For example, they administered drugs and treatments and assisted physicians. During the final last 6 months of training, members of the Corps were Senior Cadets. Under supervision, they assumed responsibility and duties of a graduate nurse. They were required to work a 48-hour week like all government employees during the war. Few or sometimes no classes were given during their on-duty time. Therefore, some of the off-duty time had to be used for learning as well. The Senior Cadets were placed where they were most needed. Most of them served in civilian, federal or military hospitals. Other students spent their Senior Cadet period in the Indian, Public Health or Rural Health Services on reservations and remote locations. After finishing the senior stage, Cadet Nurses received a diploma from the nursing school where they had started their training. 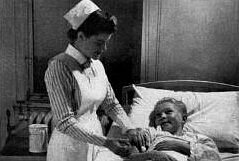 Nevertheless, a graduate Cadet Nurse had to pass the rigorous State Board examination before she could become a Registered Nurse (RN), as prewar standards were upheld for RN requirements. Few took this final step during the war, because they could commence nurse work upon graduation without the RN license.
. Cadet nurses received federal funds for tuition, board, room and uniforms (indoor and outdoor). Additionally, a regular monthly allowance of $15 was paid during the first nine months of training. 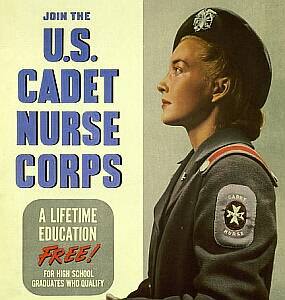 Cadet nurses received $20 a month money allowance for the next fifteen to twenty-one months (Junior Cadet stage). In the last 6 months of training (Senior Cadet Stage) the stipend was not less than $30 per month. It had to be paid by the institution using the service of the Senior Cadet nurse. Army and Navy hospitals paid $60 each month.
. The Cadet Nurse Corps also had an own Cadet Nurse March which was sung on several occasions as for example war bond rallies and parades.